Did you get a chance to see this year’s “Supermoon“? Still confused as to what was so super about it, anyhow? Simply, the supermoon is the colloquial name for what is scientifically referred to as the perigee-syzygy moon. “The … what”, you ask? Don’t worry, it’s not as complicated as it sounds. The Moon orbits our Earth, not in a perfect circle, but in an ellipse. As a consequence of this, there are times the Moon is closer to the Earth and times it is further away. For any object orbiting the Earth, the part of its orbit that takes it furthest from our planet is called apogee. The closest point, perigee. So now that we have perigee out of the way, “what was that other funny word again?” A syzygy, (pronounced, Sizz-ih-gee), is a term used to refer to an astronomical event in which 3 celestial bodies form a straight line. In our case with the Moon, the bodies are the Sun, the Earth, and the Moon. You’re probably realizing that the Sun-Earth-Moon system experiences two syzygies each month; we call them the New Moon and the Full Moon. The lunar month (29.53059 days) is defined as the period of time between two identical syzygies (Full Moon-to-Full Moon / New Moon-to-New Moon). 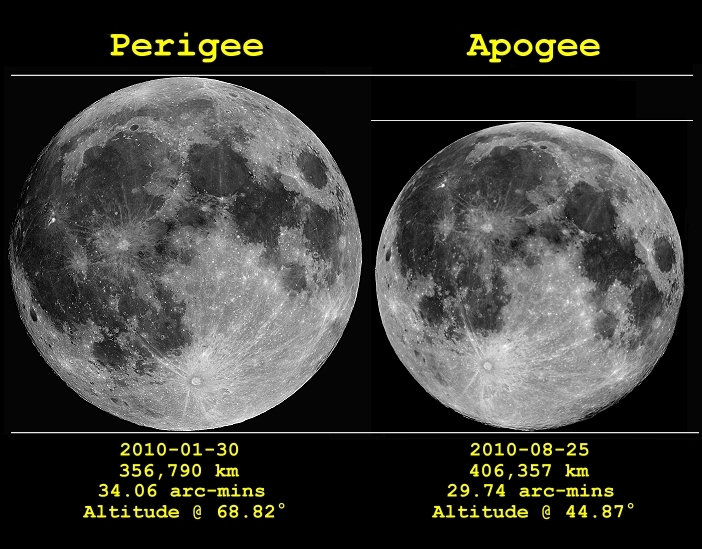 So now that we know what a supermoon perigee-syzygy Moon is, let’s talk about what a perigee-syzygy Moon does; or, more importantly, doesn’t do. There is no correlation between perigee and major earthquake activity. There is certainly no correlation between perigee and human behaviour (well, except for the fact that when people start talking about supermoons, more people are likely to take a look at the Moon on that occasion). “But what about bigger tides?” Well, yes! Tides are greatest during Full and New Moons, and there is an increase in the tides when the Moon is closer to the Earth as well. Luckily, tidal forces are weak and even the few percent increase due to the perigee-syzygy isn’t going to create anything that will cause alarm. “But I heard the supermoon is super big and super bright!” While the perigee-syzygy Full Moon is what we can call the biggest and brightest Moon of the year, it’s such a small degree bigger and brighter that its really not noticeable. In fact, last night’s supermoon was only about 1% bigger/brighter than last month’s Full Moon. It did appear 14% larger than the smallest Moon of the year, but again, you’d have to be using some tools other than just your eyes to notice the difference. Now, I purposely waited until after the Supermoon had passed to offer this explanation. Why? Because I didn’t want to discourage people from thinking they might see something special if they looked up at the Full Moon last night. It wasn’t easy to stay quiet for a couple of reasons. First of all, all of the ridiculous claims and fear that is generally associated with this event is hard to ignore — and in cases where real fear was involved, I did explain how there was nothing to worry about. The other reason it was difficult to not publish this before the event was that I didn’t want to entirely erase the hype that inevitably surrounds the “Supermoon”. Call it selfish, but I wanted people looking up at the sky last night — even if it was under some slight false pretenses. I want people looking up every night, and if some buzz on the internet can help make that happen, well then… good. The truth is, the Moon is amazing whenever you can see it. The light of a Full Moon creates amazing shadows on our planet, and is a comforting companion to have overhead at night. Waxing and waning Moons are also beautiful, because they occur at an angle with the Sun in which the shadows and craters are much more pronounced. And a New Moon (one we cannot see) offers us the darkest skies to observe the other billions of fascinating objects that are just above our heads. All of which are… well… Super.